Writing makes up a foundational part of any student’s time at Georgetown, across all programs and fields of study. Georgetown University’s Writing Center, located in Lauinger Library, believes that writing is both social in nature and a process of composing and revising one’s ideas. Far from a solitary pursuit, writing is a mode of communication that benefits from a community of discussion in a context of peer revision. The Writing Center’s mission is to create a space where clients can discuss their work and specific concerns they may have with one of our many undergraduate tutors or graduate consultants, at all stages of the writing process. Individualized conference sessions are free to students, and can be held in-person at the Writing Center or over Zoom conference. In sessions from 30 minutes to one hour, staff aim to engage with clients’ questions about everything from brainstorming initial paper topics to addressing structural concerns, as well as tracing the flow of ideas and clarity. Instead of proofreading or fine-line editing, staff provide clients with the skills and techniques that are essential to self-revision, and inspire clients for all their future writing endeavors. As one of the many great resources available to students in Lauinger Library, the Writing Center is located conveniently on the second floor (217A), right next to the Midnight Mug. 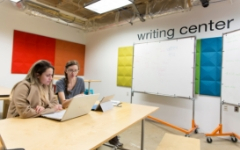 The Writing Center offers Georgetown’s student population the necessary resources to engage with academic writing. Alongside the library’s robust calendar of workshop offerings and events this spring, the Writing Center will also hold three workshops throughout the semester, all of which will take place on Fridays, and one of which will be focused on L2 grammar. The annual Writing Center Awards will also take place later this spring in a partnership with U.S. News & World Report. The awards competition invites students to submit essays in particular categories with the possibility of winning substantial monetary prizes. More information about the Writing Center’s spring programming will be available later in the season. The Writing Center hours of operation are Sunday through Thursday, 11:00 a.m. – 10:00 p.m. In order to book an appointment, visit writingcenter.georgetown.edu, as walk-in availability may be limited. Be sure to keep up with the Writing Center on Facebook, Instagram, and Twitter for the latest updates.